Just some overview photos of the garden today, so you can see what it looks like in late June. Above is the North side of the property. 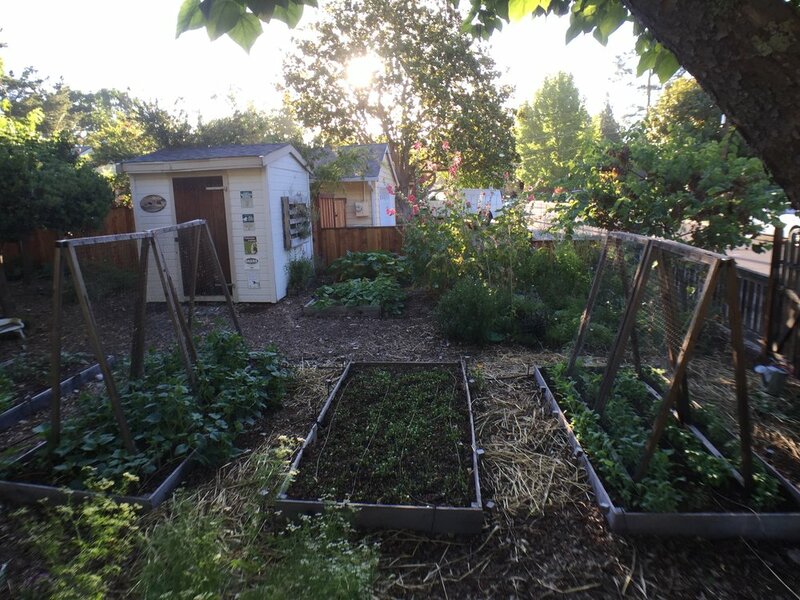 Here we have tomatoes, sweet and hot peppers, pole beans, most of our fruit trees unseen around the edges, and some pollinator gardens maturing with summer flowers. Behind me and out of sight is the patio and the hops, strawberries, olive trees, and huckleberries. You can see how many tomatoes are hanging from the vines, and we have lots of unripe peppers too. No beans, yet. Lots of peaches, plums, and strawberries. No hop cones yet. This is the East side of the garden. All along the fence we have rhubarb which is doing simply great. To the left and right are our blueberry bushes, plenty of berries being harvested every day now. Further down on the right is the bee hive, and to the left we used to have asparagus, but is now being transitioned to woodland natives. The South side of the garden is larger so I'll split it up into three sections. To the right, we see a bed of collards and basil, and I just sowed some peas there too. Next to that is the bed where I just harvested potatoes, now sown to a summer cover crop which is just coming up. Next to that are the cucumbers; we only planted the pickling type, because we like the taste of those best, even for eating fresh. Beyond these beds you can see two smaller beds, one planted to pumpkins and one to butternut squash. To the right of those is the other pollinator garden. At the bottom of the picture is a round bed of cilantro, with several succession seedings. Moving left from my perch you can see the last bed, which is seeded to several kinds of watermelon and cantaloupe, all growing extremely slowly. Our empty 'greenhouse,' which might be filled again soon with fall veg if I can figure out my timing, and some clematis I just pruned. You can see some of the artichokes. Moving left, more artichokes and our herb bed, which at the moment is a bit overrun (I need to do some dehydrating). And finally, the West and front of the house, with mainly woodland plants, both native and exotic. We have had our first few cherry tomatoes (Sungold and Green Vernissage) and are anxiously awaiting a big 'un. We should see some the next two weeks, I think! We've had some very up and down temperatures, which isn't unusual for June. July will see the beginning of settled hot weather, and then some settled harvesting of summer crops. We can't wait.